If there’s one type of cuisine my grandmother knew well, it’s Mexican. She and my grandfather took frequent trips to Mexico. While my father and uncle were off misbehaving, my grandmother explored the vibrant crafts and flavorful foods. She learned how to cook both traditional and untraditional dishes, adding her own twist when they returned to New York. Eggs Jalisco is an example of just that: traditional Mexican flavors with a twist …two twists actually because I couldn’t help but add fresh avocado and tomato as well. This dish includes a simplified version of my grandmother’s refried beans recipe. If you have never made refried beans, it’s a must try – even if you don’t like refried beans. Since it contains a lot of butter (though I cut it down), it’s not the healthiest recipe in the world. I can promise you though, these beans are unlike any you’ve ever tasted and worth the extra calories. And if you really don’t care about your waistline, try replacing the butter with bacon fat. Are you drooling yet? I made this version of Eggs Jalisco for dinner and I was very happy with the results. It wasn’t until afterwards, when I was reading through the original recipe in my grandmother’s cookbook, “The Art of Good Cooking,” that I realized the tortillas were supposed to be fried. This makes more sense, given the textures and weight of the homemade refried beans and the tomato ham sauce mixture. However, soft flour or corn tortillas are perfectly delicious. If you would prefer to go the hard shell route, simply buy tostada shells – it’s much easier than trying to fry your own. Or, if you’re a bit more ambitious but don’t want to deal with the calories or required energy to deep fry, brush soft tortillas with a little oil and bake them. 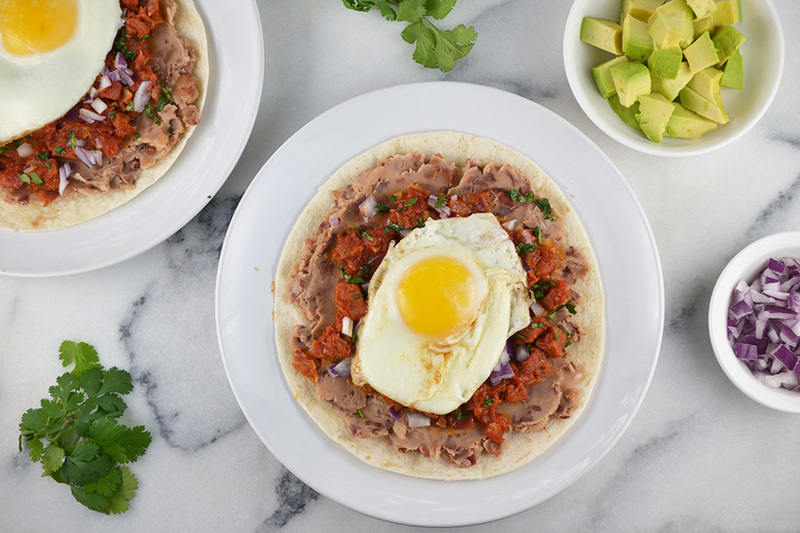 Whichever form of tortilla you choose, the combination of freshly made refried beans with tomato ham sauce and the runny yolk of a fried egg, is undeniably crave worthy. Place beans in a strainer and rinse under cold water and set aside. In a medium saucepan over medium low heat, melt a 1/2 cup of the butter. Add beans. With a heavy fork or potato masher, mash beans until they almost form a puree. Season to taste with salt. Reduce heat to low and continue to cook, stirring occasionally. Heat a large heavy saute pan over low heat. Add the remaining tablespoon butter. Fry eggs very slowly until white is cooked but yolk remains runny. Meanwhile warm tortillas. Spread each tortilla with some of the mashed bean mixture. Spoon a little of the tomato ham sauce on top. Sprinkle with chopped onion, parmesan, avocado, and fresh tomato. Carefully placed a fried egg on top. Sprinkle with cilantro. Serve immediately.